A good night’s sleep is absolutely essential to all-round health and well-being, and a big part of this is the bed you’re sleeping in. Lots of emphasis is put on choosing the right mattress and pillows but you might not pay as much attention to your duvet, even though this is another important factor when trying to achieve the perfect night’s sleep. So, we’ve put together a handy guide to help you pick the perfect one…. To start with, you’ll need to establish which size is right for you and will be the right fit your bed. Some choose to opt for a duvet size that is one up from their bed size, i.e. a king size duvet on a double bed, as it gives that extra snuggle factor…and is great if you and your other half constantly fight over the duvet! A duvet’s ‘tog’ rating measures how warm it is. These ratings range from 4.5 to 15.0, and all you need to remember is: the higher the tog, the warmer the duvet – easy! Lightweight duvets, suitable for use during the summer. Medium weight duvets, suitable for spring/autumn use. Extra warm duvets, most suitable for snuggling down in the cold winter months. Duvets are filled with a variety of natural and synthetic fibres, each with their own benefits. We have provided info on natural fillings below, however Wilko only stock synthetic-filled duvets. It’s a common misconception that a duvet containing a synthetic filling provides less warmth than a natural one, but this isn’t true. Synthetic duvets are much less expensive and in a lot of cases they are much more practical because they are incredibly durable and can be machine washed. Most synthetic duvets are filled with hollowfibre, which is the best synthetic filling when trying to achieve a down-like feel as it is luxuriously soft and lightweight. With this type of duvet, air is retained between the hollow chambers within the fibres, providing extra warmth and comfort, whilst maintaining that light feeling. This makes for a warm synthetic duvet that isn’t too heavy. Although all synthetic duvets are non-allergenic (meaning their fillings will not cause allergic reaction), allergy sufferers may still prefer to opt for an anti-allergy or anti-bacterial filling that has been specially treated to eradicate reaction-causing dust mites and prevent the growth of bacteria, mould and mildew. Regular washing of all synthetic duvets will also help to eradicate dust mites in general. Natural down and feather duvets will breathe naturally, which is what keeps you cooler in summer and warmer in winter. Down duvets are the more superior of the two as they provide better insulation. The down of a bird is located underneath the feathers and is responsible for keeping cold air out and warm air in, allowing birds to keep warm in freezing temperatures. 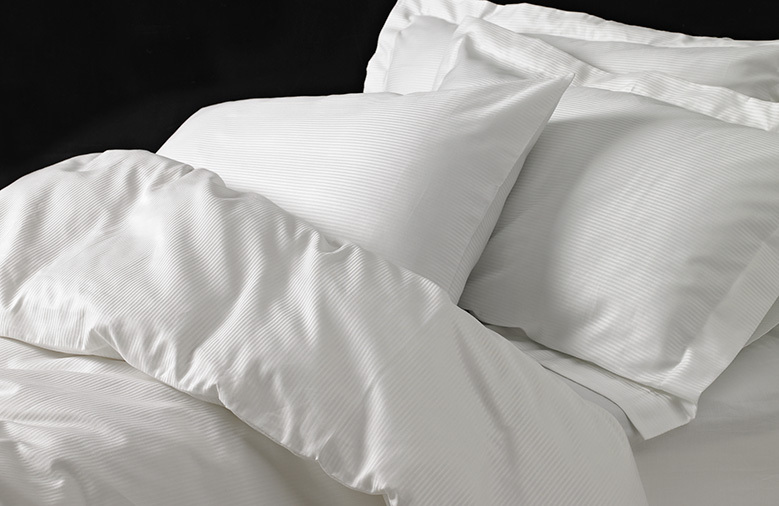 This down is also far lighter and fluffier, making it an even more lightweight choice for a duvet. Furthermore, because feathers aren’t as good at insulating, more of them will be required to provide the filling of a duvet, adding to its weight. You will also find duvets that offer a mixture of the two but, as a general rule, the better quality and long-lasting duvets will contain more down. Down-only duvets will last around 20 years while feather and down, or feather-only duvets will last approximately 10 years. On the whole, natural duvets are lightweight but extremely warm, thanks to the natural insulating properties of the down. However, this type of duvet tends to be more expensive, so if you’re looking for a better value option (or if you suffer from allergies/asthma), a synthetically filled duvet may be a more suitable option. New duvets should be aired for 24 hours before use and, once in use, it’s a good idea to air them regularly. Remember to shake your duvet to help keep it plump and maintain its warmth (as shaking fills it back up with air). To prolong the life of your duvet, you should try not to wash it too frequently. However, if you suffer from allergies or asthma, then more regular washing is recommended. Anti-allergy and anti-bacterial duvets are designed to be washed regularly, so this should help solve the problem. When washing your duvet, always refer to the manufacturer’s care instructions. For synthetics duvets, washing at 40°C will get it clean, but 60°C is the temperature recommended for getting rid of all those annoying dust mites. For natural fillings, professional laundering is also an option. This is particularly useful for drying, as this can be difficult at home if you don’t have a tumble dryer (or if your duvet isn’t suitable for use with it). Over time, duvets collect dirt, dead skin and dust mites or simply wear out from washing. Whilst many people do tend to wait until their duvet wears out before replacing it, it is recommended to replace a synthetic duvet around every 3 years, whereas more durable natural duvets can last more like 5 – maybe longer for more premium (higher down content) variants!